Yep. It’s one of my favorite traditions around the Underwood house. Every year, after Thanksgiving dinner is served and cleaned up, when everyone is stuffed and just about ready for a nap, we hand out the Thanksgiving Stockings. I’ve written about this fun tradition a few times over the years. And, over the years, our own Thanksgiving stocking contents have varied and evolved. As Casiday has gotten older, we don’t buy the Christmas hairbows or matching doll pajamas. But the perennial favorites like Christmas candy and ornaments continue to make their appearance year after year. This year, though, I wanted to share some ideas for FAMILY Thanksgiving stockings. 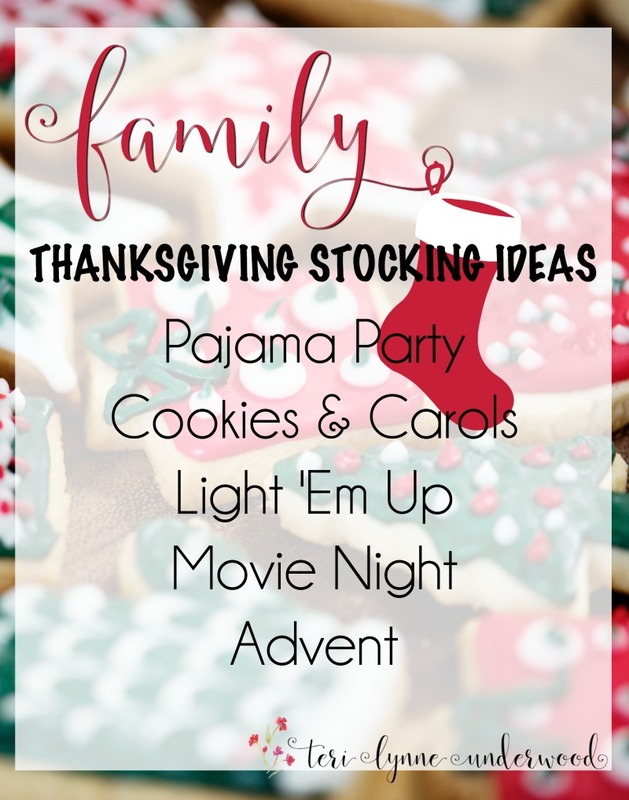 Rather than doing an individual stocking for each person, these are suggestions for creating (or maybe just repackaging) a family experience. Each of these could be things you already do. In fact, the overly ambitious among us (or the better time managers than me) may do all of them. 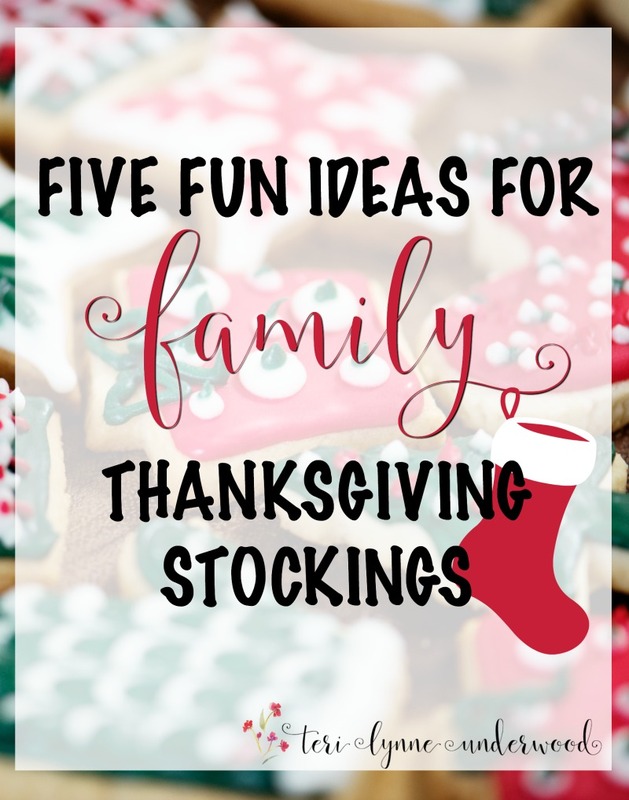 But, for those of us scrambling at the last minute, these are simple ideas for fun family Thanksgiving stockings. Wrap all of this up in a big quilt or blanket and tell your family you’ll have a pajama party on a specific date. You may even want to invite other family members to be a part. That night, everyone gets in their pajamas and you fix s’mores and read aloud your favorite books. Be sure to share some of your favorites from childhood and, if your kids are older, add in some of the books they loved when they were younger. Set aside one day for baking cookies. Listen to your favorite Christmas music while you bake and decorate. Make a list of some people you’d like to give cookies to and once you’re done baking, wrap yourselves up in your new scarves and head out with your Christmas music to deliver cookies and carols to the people on your list. I think this one would be fun to do every week Gather everyone together and watch one of your family’s favorite Christmas movies. 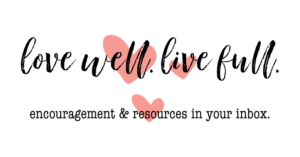 My friend Courtney has all kinds of Light ‘Em Up ideas on her website and I LOVE this! 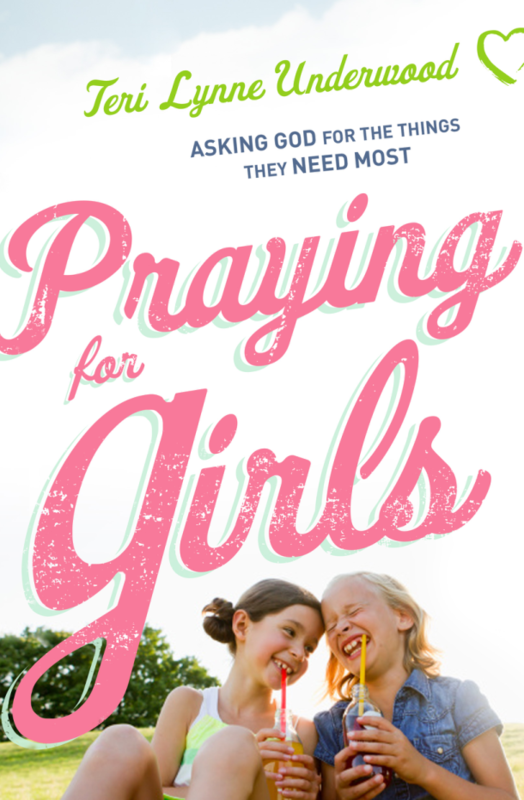 Get your family involved in brainstorming ways you can serve others and bless them. And, after you’ve spent a fun day doing light ’em up projects, pile everyone in the car with their new travel mug full of hot chocolate and drive around looking at Christmas lights. 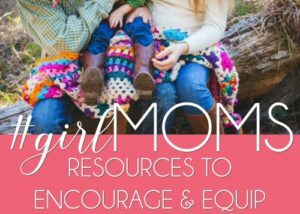 There are so many fun and creative ways to keep your family focused on the anticipation of Christ’s coming through the busy holiday season. Okay, none of these is a brand new, earth-shattering idea, I know. But they are doable and fun … and if you are looking for a way to build some stronger memories with your family (even if your kids are big and have kids of their own), these are some great places to start. Also, I think it would be awesome to gift a family Thanksgiving stocking to a family you are especially thankful for. What is one your family’s favorite traditions during the holidays? I’ve never thought about a thanksgiving stocking before. But I love the idea. I’m going to do the Cookies and Carols with my grandchildren. They will be out of school before Christmas and I will be keeping them some of that time. We will bake cookies, and then deliver them to their friends etc. I love this!! So excited that it gave you an idea for a new way to celebrate with your grandchildren!